Union Syndicale Fédérale was set up 40 years ago, when it was known as « UNION DES SYNDICATS ». Trade union organisations join together under its banner to espouse the cause of unity and solidarity with the world of work. What these organisations have in common is their desire to promote the ideal of a genuine European Public Service which will bring about European integration in peace and prosperity, in the interest of the people of Europe. 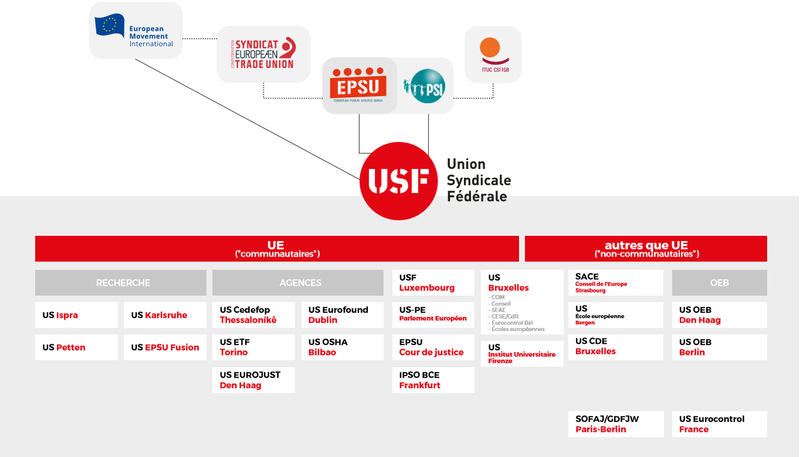 Union Syndicale Fédérale (USF) currently has 22 Unions Syndicales affiliated, representing a variety of locations within the European and International Public Service. Their members number thousands of people of all grades, nationalities, professions and contractual status. Union Syndicale Fédérale does not confine its ambition to protecting the moral, material and financial interests of its members or of staff of the institutions. Working together with the trade union movement in Europe, to which it is affiliated, it seeks, beyond that, to guarantee the people of Europe a public service for all of Europe which is stable, independent and up to the job, and mindful of how it manages the public’s money. To achieve this, Union Syndicale Fédérale conducts its activities either directly or, where more appropriate, through its affiliates in a manner at once firm and constructive, acting as a counterweight to unfair pressure and to behaviour which conflicts with its principles. In this way Union Syndicale Fédérale will do its bit to contribute to the evolution of the European society and to European integration, with due respect for democracy, workers’ rights and Human rights, keeping an open and tolerant mind.